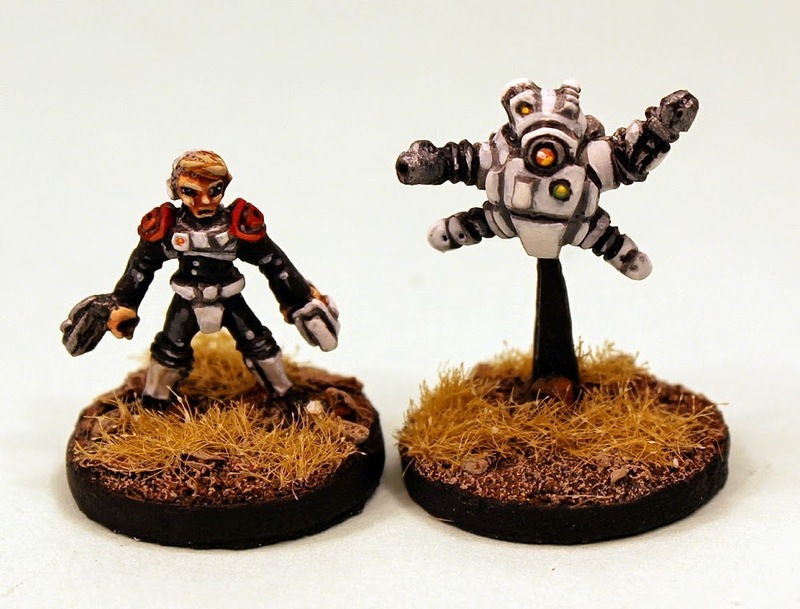 The Ion Age Blog: IAF063 Arachne and Giliam released! After their successful defence and taking the fight to the Canlastrians with the portable castle Sawlande during the siege of Cylde IV the Lady Arachne and Knight Errant Giliam have seen a lot more battles with the Prydian Army. Giliam had been, as is fitting for a Knight Errant, wandering the systems looking for a cause and his arrival in Cylde space in the weeks before the invasion gave it to him. The Lady Arachne is a fierce commander who values Giliams technical skills and he her tactics in war. They make a fine pair and command a Banner (4 Lances) in the 9th Retained Regiment. Arachne is dressed in personalised Alwite powered armour and carries an Octo powered sword while Giliam wears Alwite powered armour and carries a Valerin Laser Rifle and a Data pad making use of specialised googles and helm displays. Two excellent personality miniatures for your Retained Knights of the Prydian Army or any Marcher Baron force in 15mm scale white metal. As always this code can be bought as a pack or as single miniatures or select the three packs and save 10% option on the page. Go HERE. Price 1.20GBP per pack. 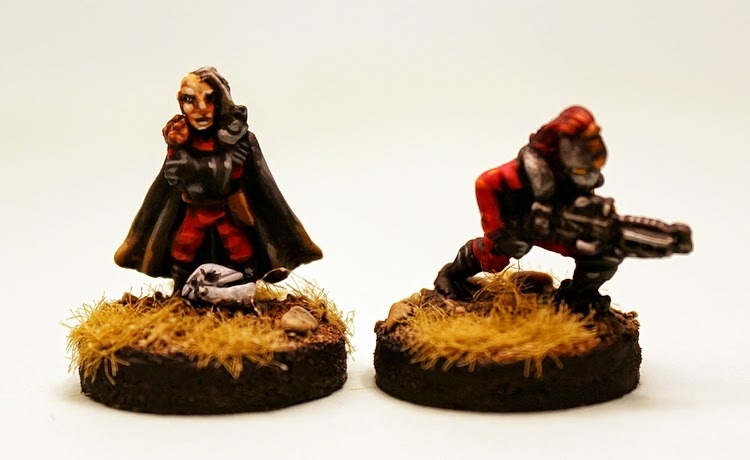 We have other two miniature character packs which are great for any setting and game system in 15mm scale or just for collecting and painting. 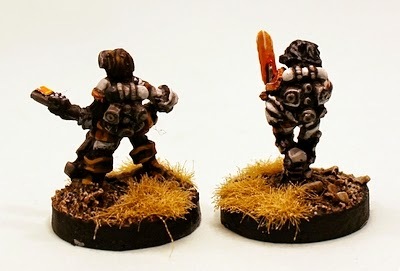 Some are more popular than others but all have their charms and certainly one of them really captured the hearts of 15mm science fiction wargamers around the world. I will not spoil it by telling you which one but here they are. Allied to the Prydian Army, the Marcher Barons and the Khanate Empire. 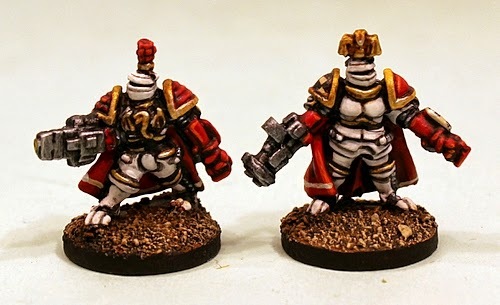 Personality Nobles to head your Retained Knight forces! 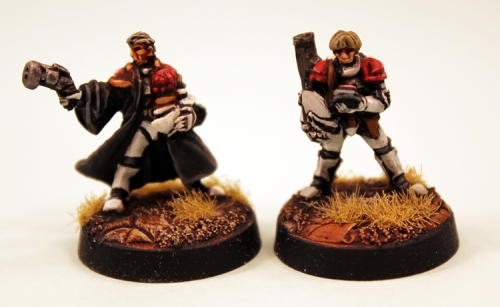 Balthazar and Jerome work as a close team and are in the senior command structure of the 43rd Knightly Regiment of Prydia. Go HERE. Husband and Wife team the Baron and Baroness of Murdo wear the heaviest of Prydian Army armour the super heavy Noblesse type. Characters for leading your Desteria Knights into battle. Go HERE. 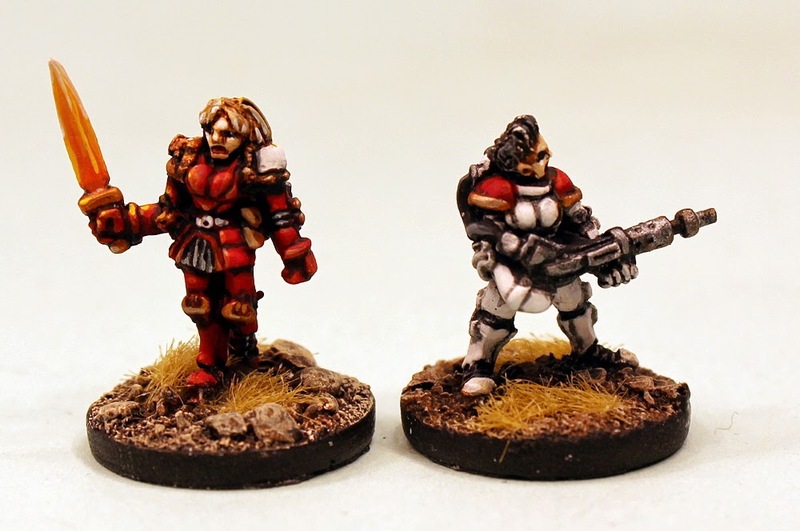 Personality female miniatures to lead your Retained Knight forces. Ellen and Ripley are combat veterans and often find themselves facing vicious aliens such as the Shia Khan Empire or worse... Go HERE. A great code for adding interest to your forces. A veteran battlesuit pilot along with an agile drone adept at repair and rescue work in battle. Go HERE. The Styx Legion is one of the main foes of the Prydian Army in its war against the Khanate. Its leader is Legate Vanya a veteran warrior who inspires great loyalty and fear in equal measure. Vanya often has a personal guard in battle composed of Legionaries that have his mark. Go HERE. We have put a special offer this week on Legate Vanya of 10% off the list prices for seven days only. The month is now underway and as we promised it is an infantry focused period of time. 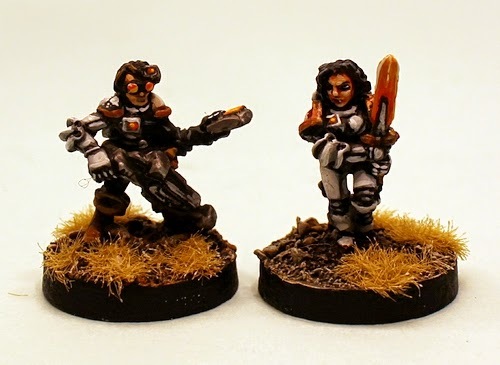 Last week we released the fantastic all female IAF059 Muster 2nd Squad and we would like to thank you all for your interest and support in these lady soldiers. We are looking at characters this week as we release this new two figure pack and the next two weeks will be firstly a preview of our next big release (we have no Early Supporter Offer this month) and then a week later its release with an offer. What will this be...well no details for now aside from to say that we are up-gunning our infantry once more with some codes that go well with the fire support a Battlesuit can bring but its not a vehicle. The IMP14 Female Retained Veteran miniature is free in all orders this month and remember that by placing an order with us you will sign up for an account with the website and that means you get Reward Points in all purchases (plus the monthly free miniature). These points can be used any time to get free products and discounts on orders.